← Eat a homegrown salad, kids. Add some edible flowers. 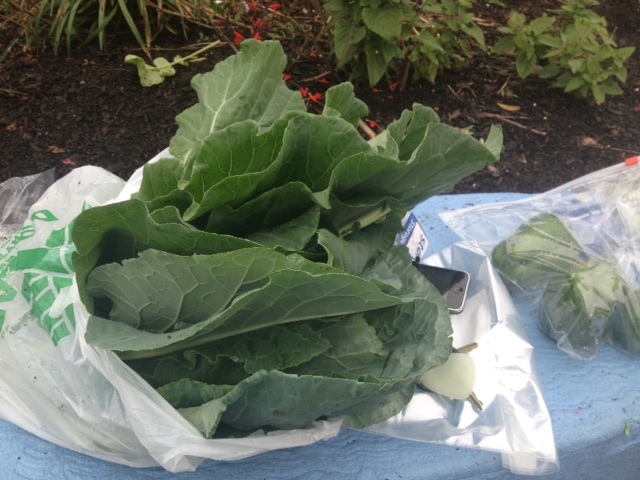 The community garden at New Image Youth Center is bursting with produce, bursting I tell you. Yesterday, I tended to the beds in the rain for a few hours; the rain and I were partners, cleansing the plants, nourishing them. We have quite an ensemble in our little farm: radishes, beets, collards, broccoli, carrots, tomatoes, green peppers, every herb imaginable. 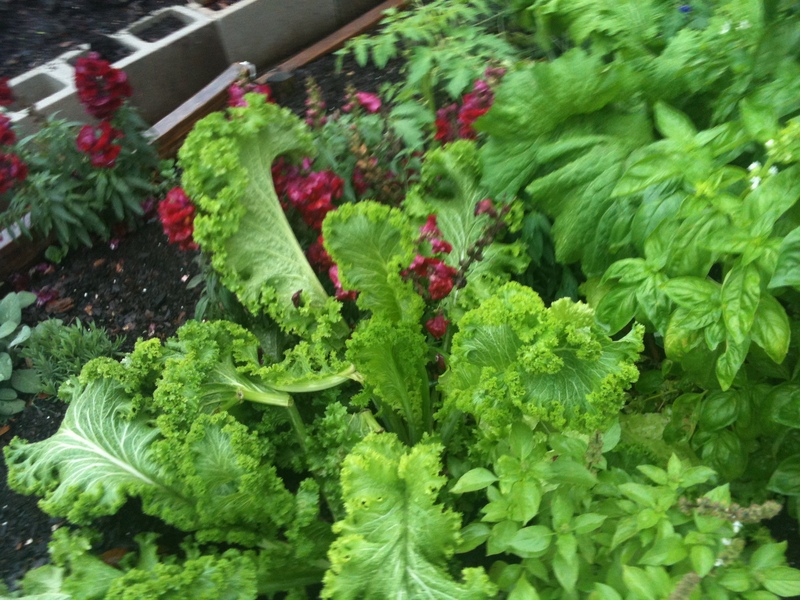 And the lettuces…how many varieties you ask? I counted six. We have a gourmet selection of lettuce. Two hours of gardening in the rain is rejuvenating. Sure, you get funny looks. People ask what you’re doing. You get wet. Maybe even soaked. In the midst of it, though, it’s perfect. A gardener’s spa treatment, if you will. Yesterday’s harvest was nine bags of produce. Nine. 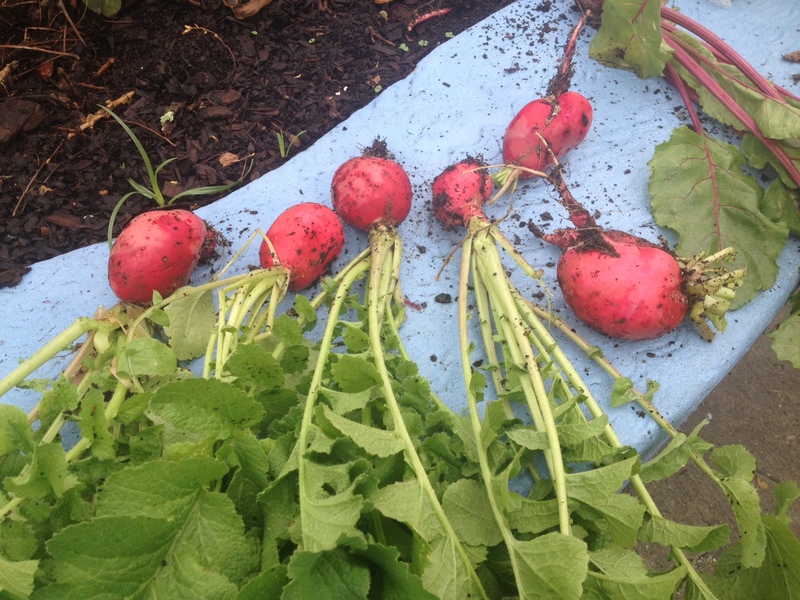 And to my surprise and delight, our radishes were enormous, the size of baseballs! And they weren’t split open from being left too long. We dominate in radish production. Next week, we’re planting mammoth sunflowers. This entry was posted in Uncategorized and tagged community garden, gardening, gardening with kids, harvest, local food, new image youth center, orlando, pesticide free, spring. Bookmark the permalink. 1 Response to Radishes the size of baseballs! Very cool! Fun to find this post.